Application Virtualization is a feature that you can use Applications remotely from your computer without installing the Applications on your local computer. 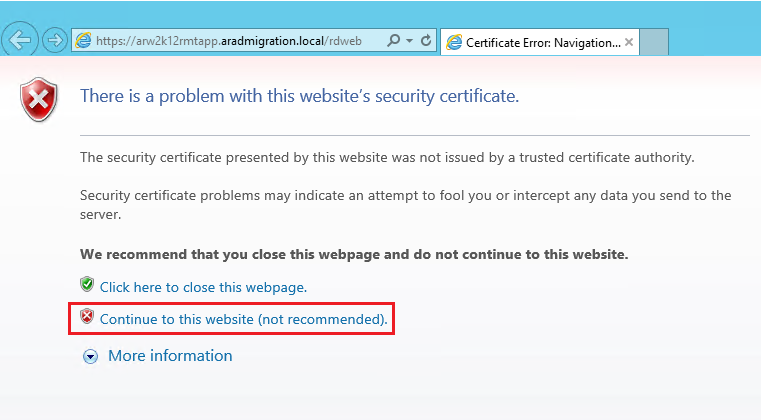 Sometimes you may worked with Citrix XenApp and you may have some idea about this technology. 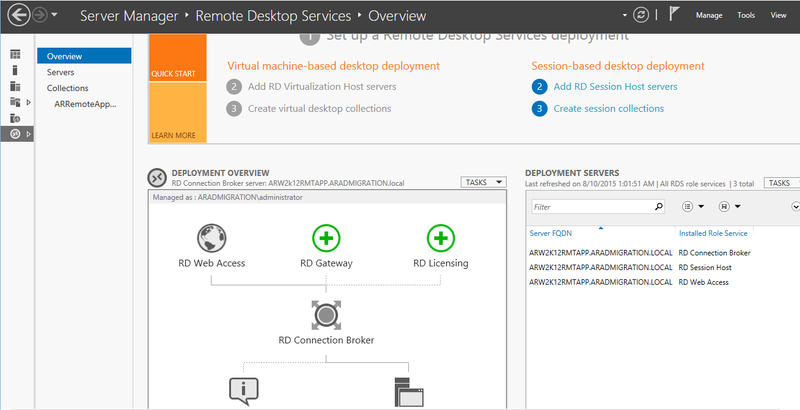 Here I’m not going to compare this Microsoft Remote Desktop Services with Citrix XenApp, just to give you an idea about Microsoft Remote Desktop Services (RDS). 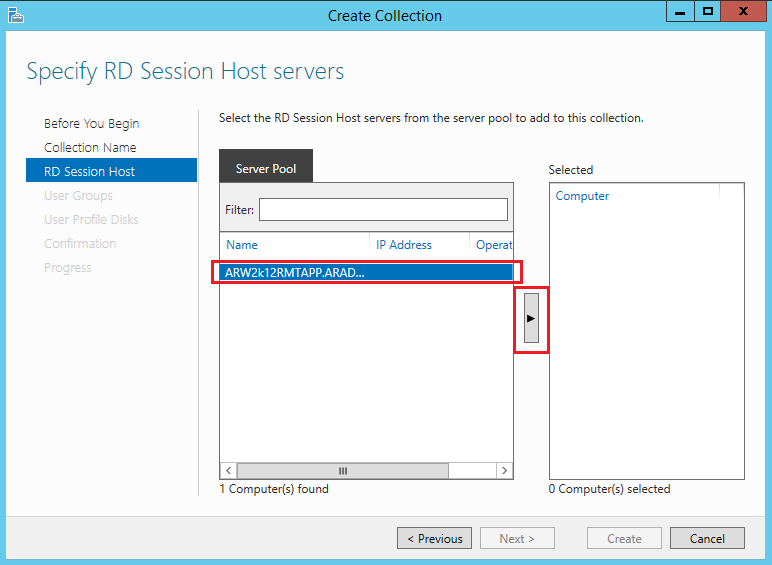 Sometimes you may heard of “Remote Desktop Session Host”(RDSH), RDSH is the role in RDS after the release of Windows 2008 R2. Prior to that, this role was known as “Windows Terminal Services” and it allows multiple connections to a remote server. 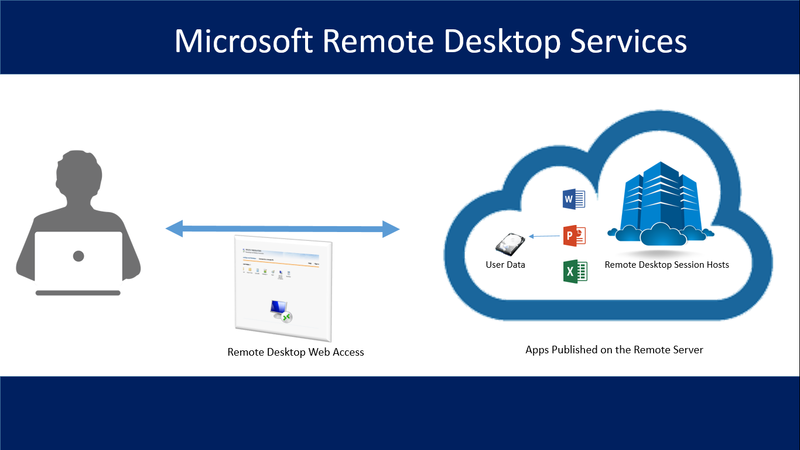 You can use Microsoft Remote Desktop Services to Virtualize your applications on a Remote Server. 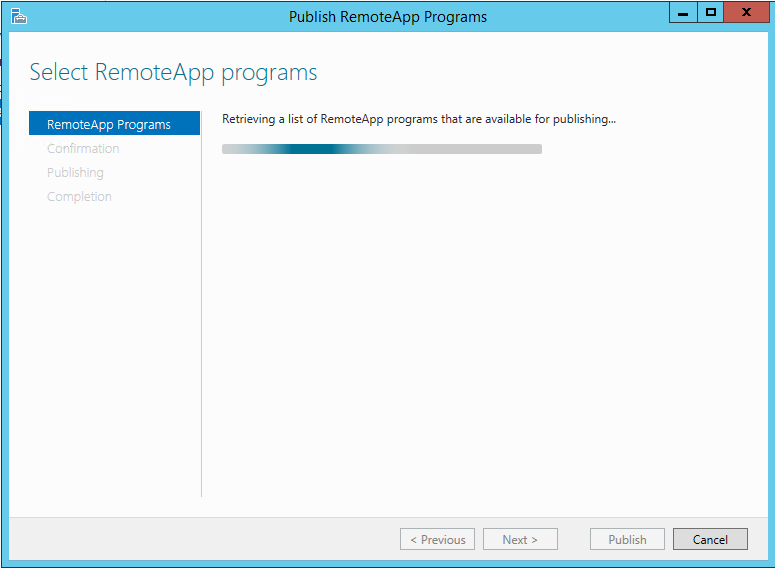 Basically there are two types of RemoteApp installation methods. 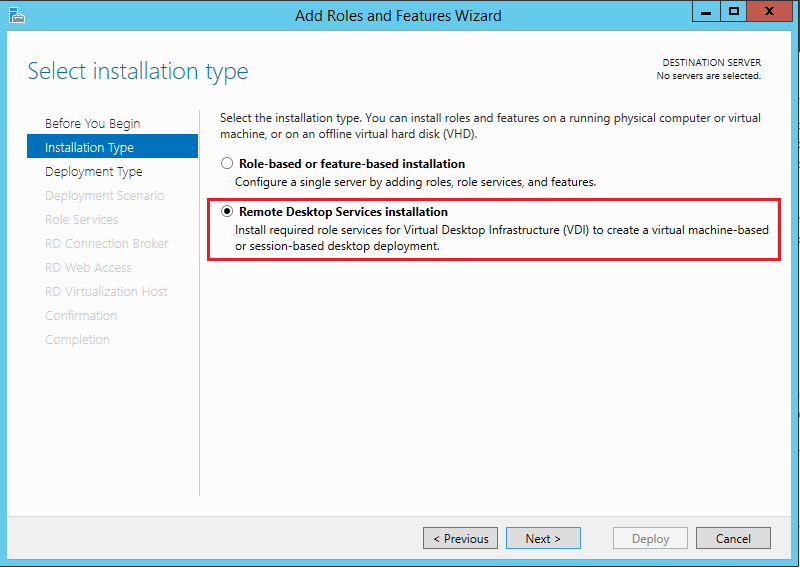 You can use Standard Deployment method if you are installing this Remote Desktop services across the multiple servers. 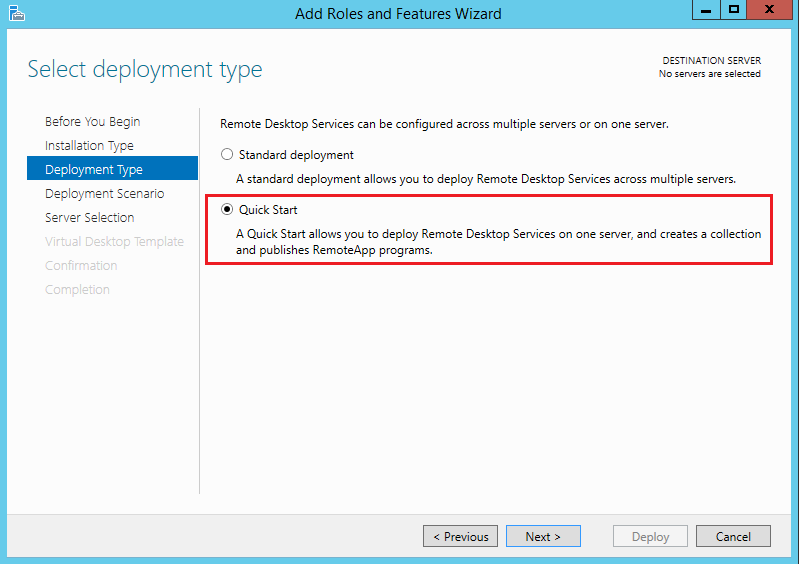 Quick Start method is to deploy Remote Desktop services on one server. 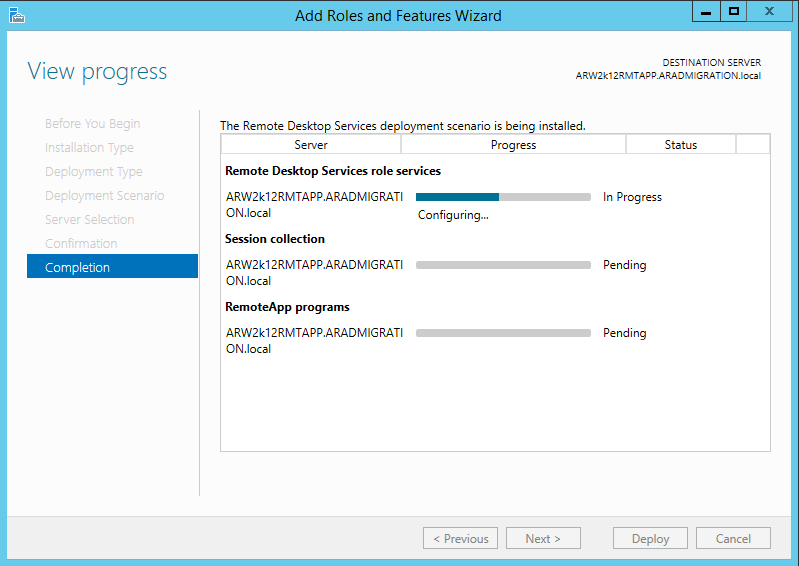 Here I’m going to show you how to deploy “Quick Start” Method to use this RemoteApp services and I will show you the Standard procedure in one of my future post. 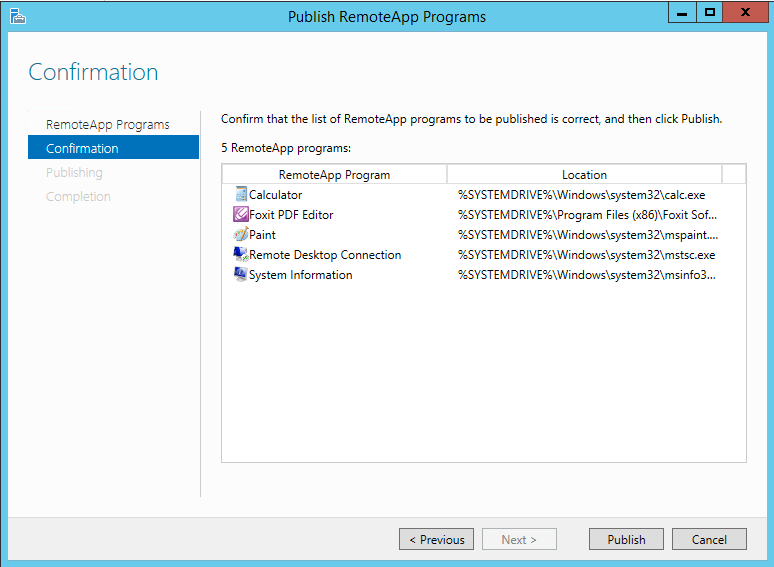 I’m going to use a single Windows 2012 R2 server and I’m going to install this Remote Desktop Services on this Server. 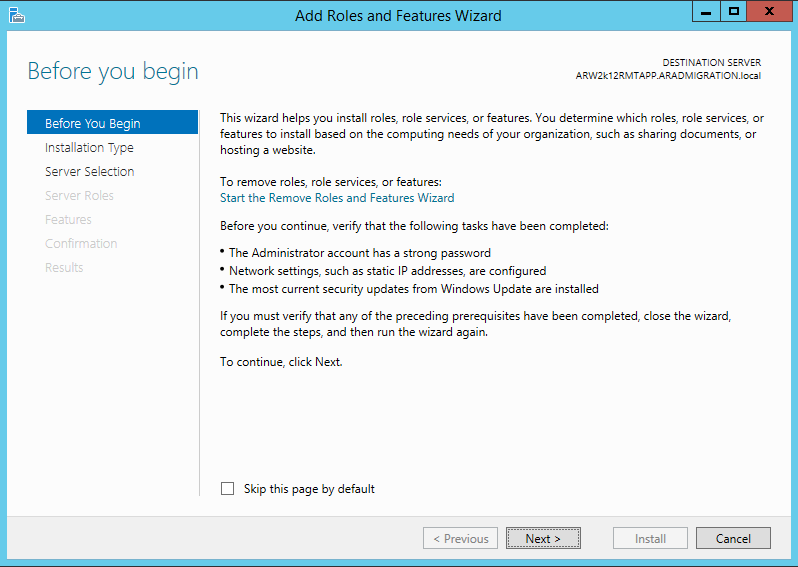 First of all I have done the initial configuration of this server such as enable Remote Desktop Connections , assigning IP addresses, Updating Windows and adding to a domain. 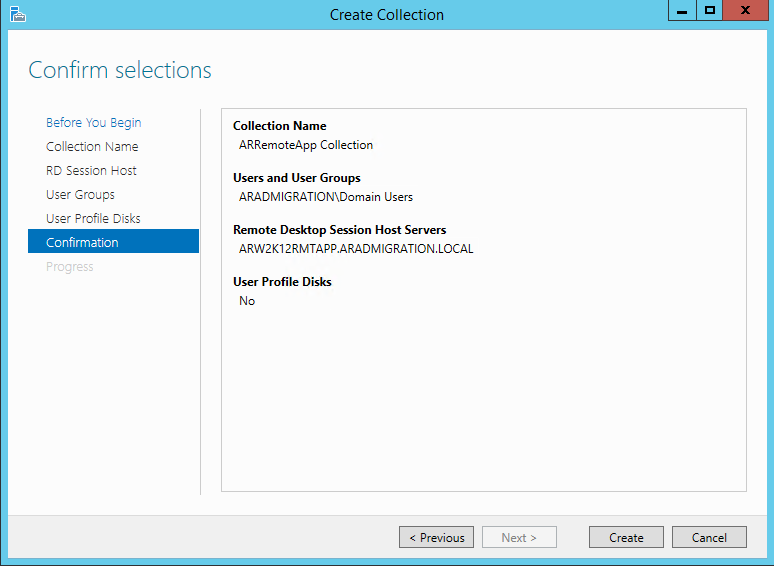 Now I’m jumping in to my RDS Server (ARW2k12RMTAPP) and going to deploy this RDS services. Here we are going to deploy RDS using “Quick Start” method as we are going to install all these services in to one server. Select the “Quick Start” and Click Next to continue. Virtual machine-based Desktop deployment: An individual VM is running with a Desktop OS. There is only one user can login to these VMs at a time. 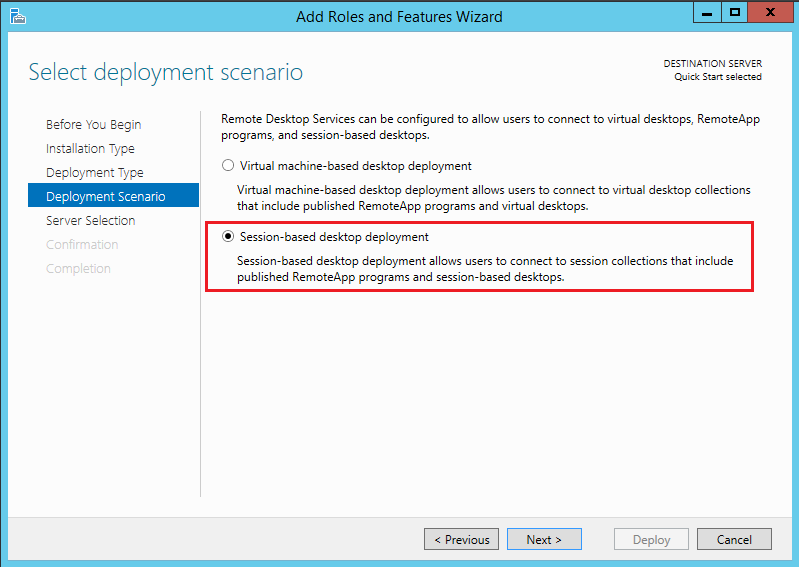 Here we are going to use a server with multiple sessions for these users, so the “Deployment Scenario” should be “Session-Based Desktop deployment” , Select the option and Click “Next” to continue. 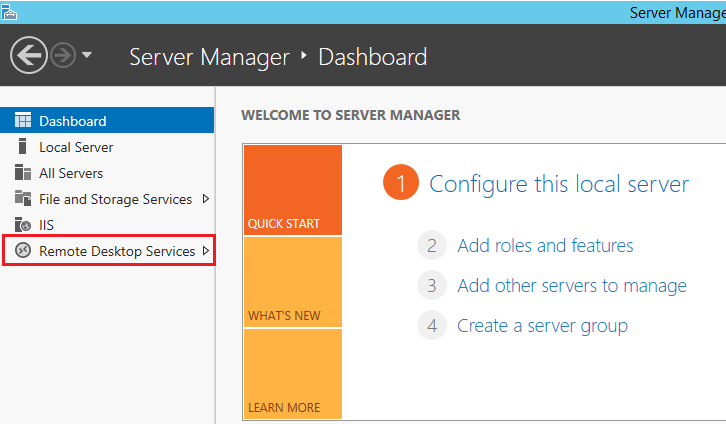 At the next step you need to select the server that you are going to use for this from the server pool. In my case I have only one server. Select the server and Click on the small arrow to add the server. 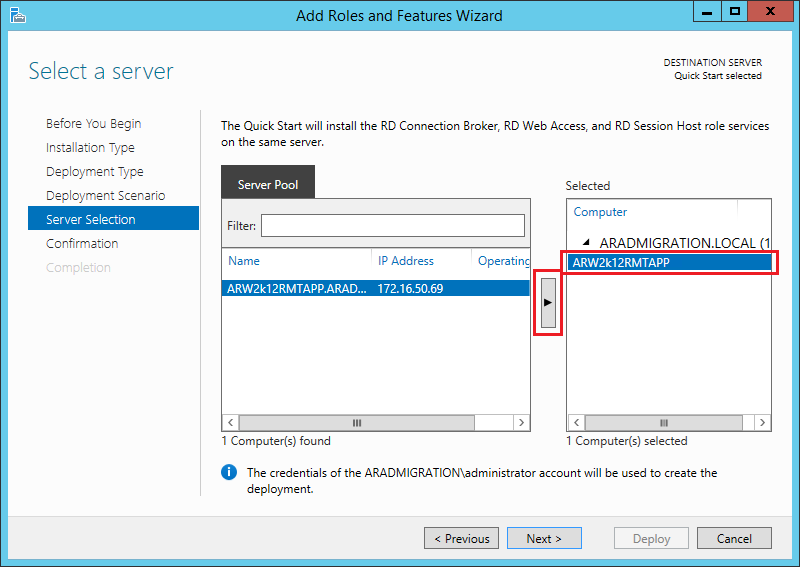 Here this wizard will install “RD Connection Broker” , “RD Web Access” and “RD Session Host” services on the same server. 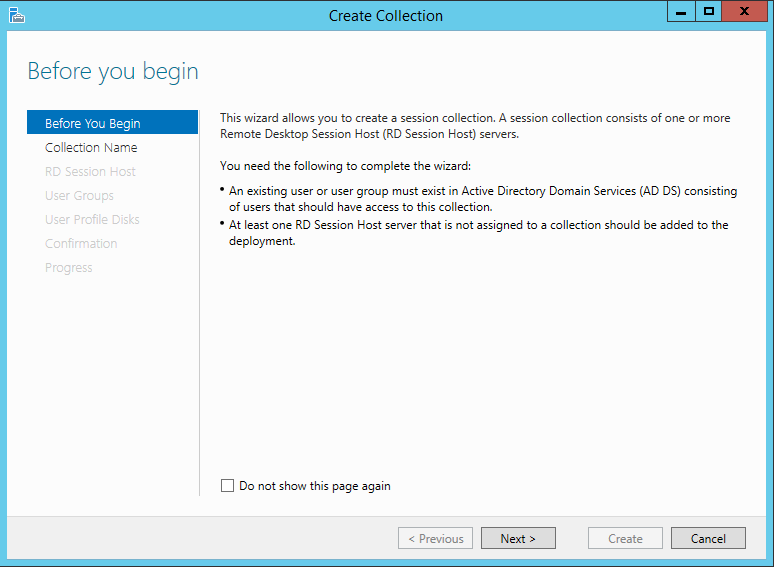 RD Connection Broker – This Role service helps to reconnect the existing disconnected user session (due to a network failure or disconnected by users ) back to the same user session when the users are trying to re-connect to the RDS. This RD Connection broker role keeps the track of users sessions details in a load balanced RD server farm such as RD Session host server which these users sessions resides, name of the session, user name of the session, session state, session ID. RD Connection Broker uses these information to re-connect the disconnected sessions. 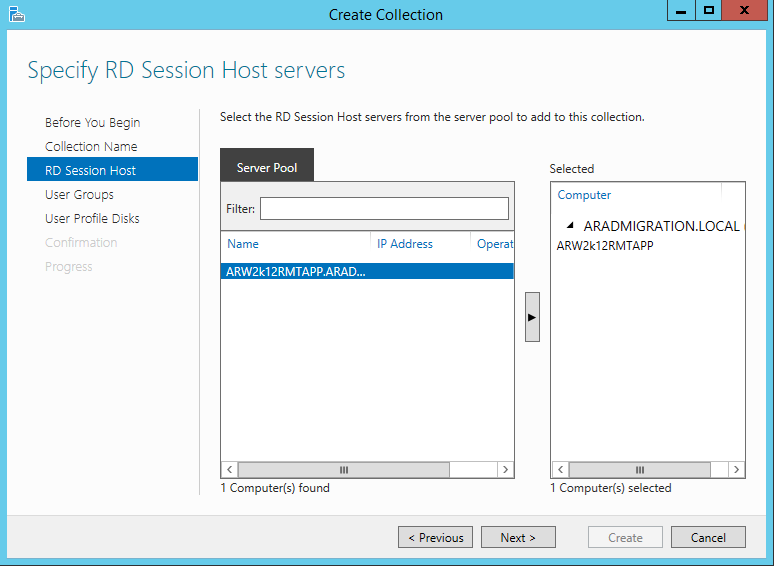 RD Session Host (RDSH) – RDSH is the server which host all the windows based applications to run during the user’s remote session. 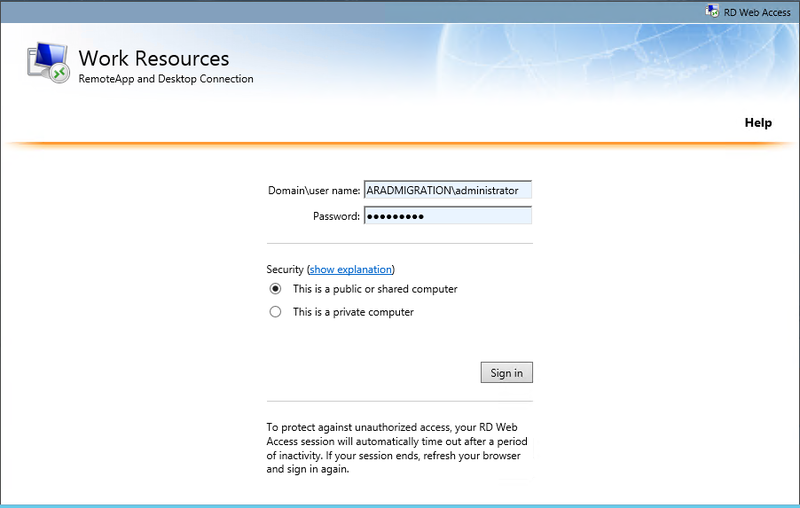 RD Web Access – Formally known as the Terminal Server Web access which helps to connect to the RemoteApps and Remote Desktops through the web browser. 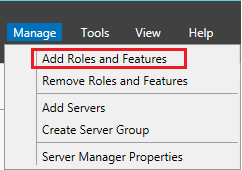 In this scenario I have used “Quick Start” deployment method and it has only one server for all these role services. 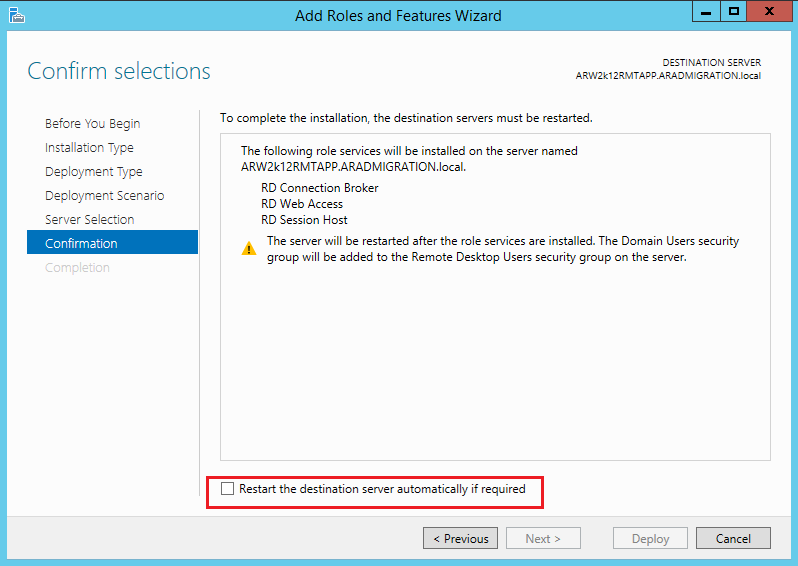 At the Next step You can see the “Confirmation” window and you have to select the “Restart the destination server automatically if required” option to deploy the Services. 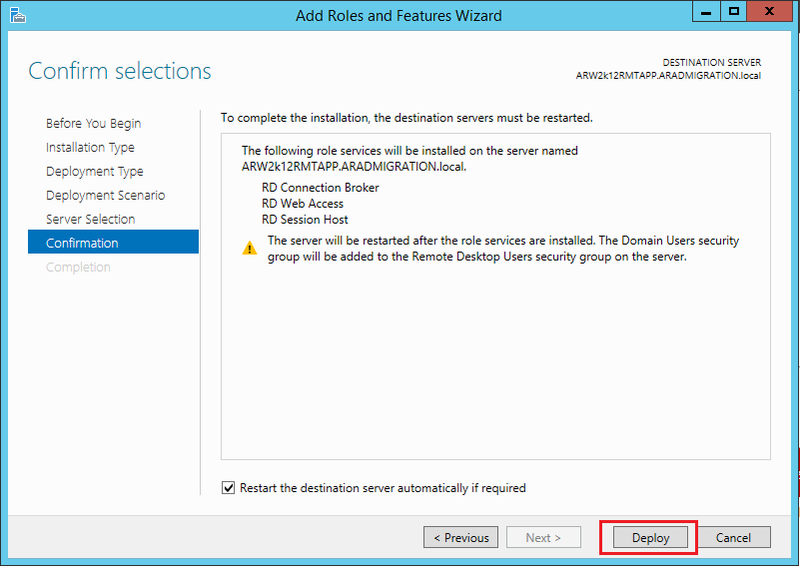 Once you select the option Click on “Deploy” to continue the installation. 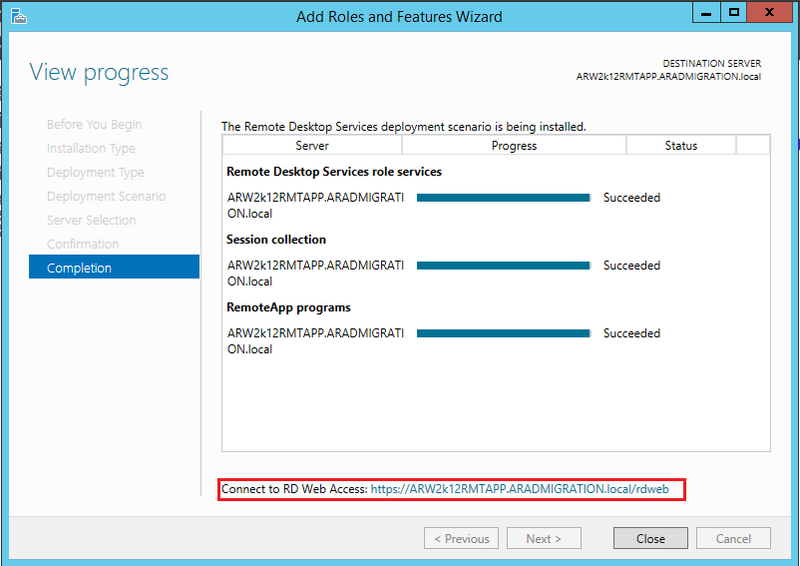 Completion of the Deployment will give you an URL to access the RD Web access console to access the RemoteApps and Remote Desktops . In my case the URL is : https://ARW2K12RMTAPP.ARADMIGRATION.local, click on this to open you a web browser to access the Remote Apps and Desktops. You can see a small “warning” appear on the web browser and click on the “Continue to this website (not recommended).” option to continue. Click on the any of the Default App to test the Connectivity, I have click on the Calculator and you can see a window similar to this window, click on “Connect” to continue. You will see a username password prompt and type “Administrator” Username and password to launch the App. 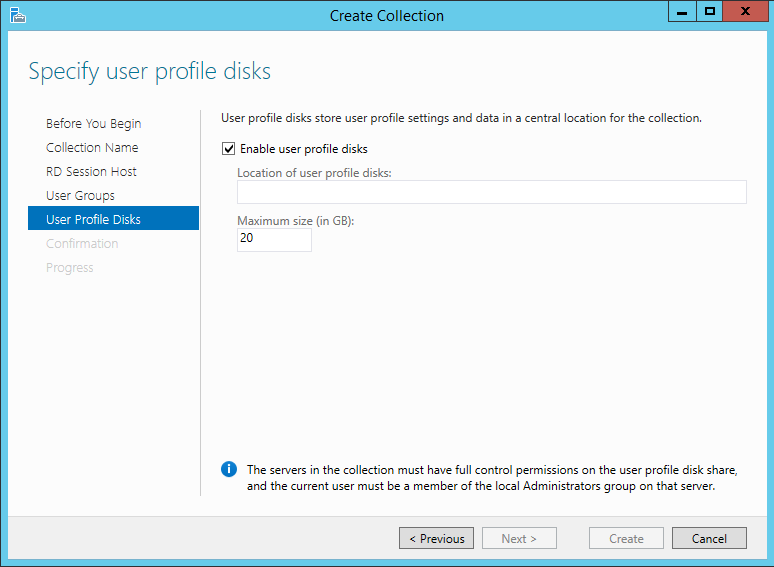 Go to collection, right click on the “QuickSessionCollection” and select “Remove Collection” to remove the default Apps Collection. There is a really cool feature at the next step where you can save all your documents and can work as a roaming profile of the RD Session host for a user. 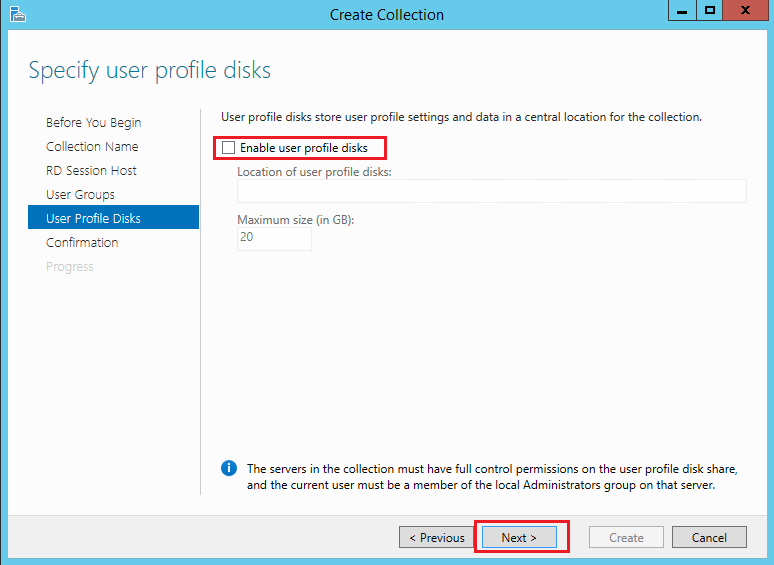 You have to provide a shared location to keep user’s VHD files to map when they are connecting to RD Session Host server, You can specify the Maximum Size of the VHD in this step. But here I”m not going to use this option here and I deselect the option and click on “Next” to continue. 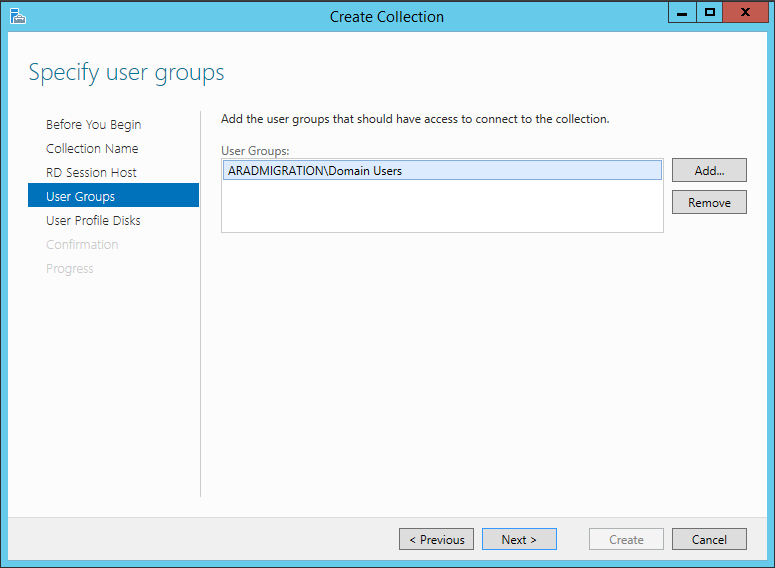 At the next step you can see the Confirmation and Click on “Create” to create the Collection set. Let this wizard to complete the creation and succeed the creation , once it complete the creation close the wizard. 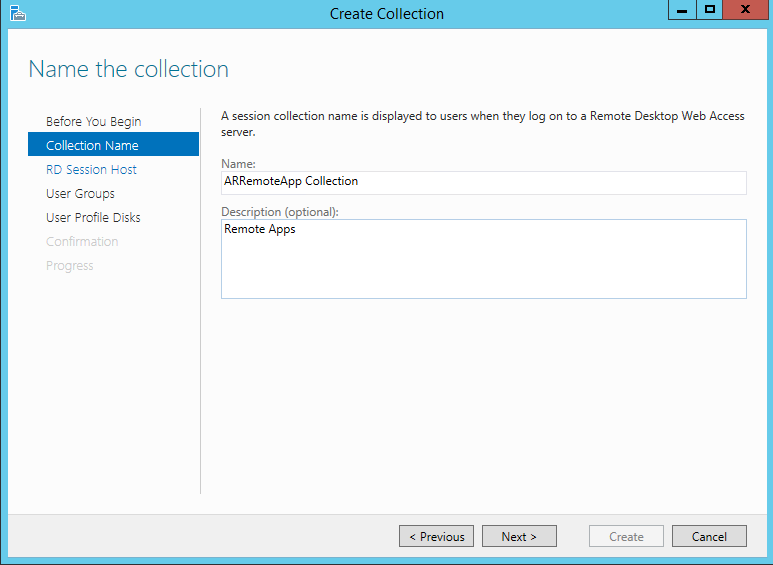 We have successfully created the Collection and now we are going to publish the RemoteApps on this collection. 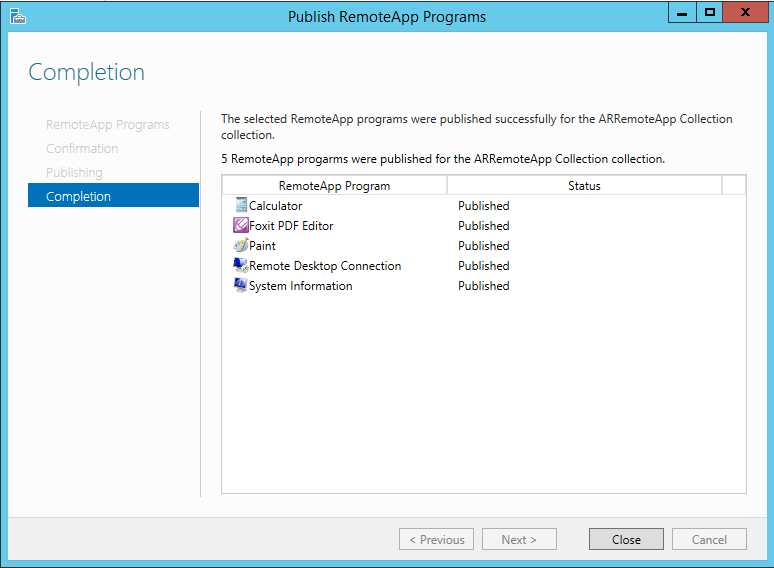 Go to your Collection and click on “TASKS” and select “Publish RemoteApp Programs” to publish Apps for remote access. 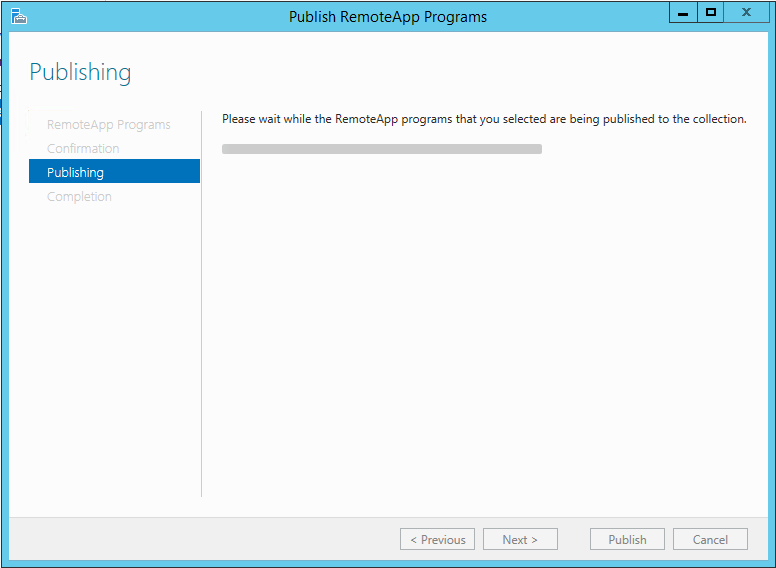 This will start the “Publish RemoteApp Programs” wizard and select the Apps that you need to publish for the Remote Access. Click on “Next” to continue. 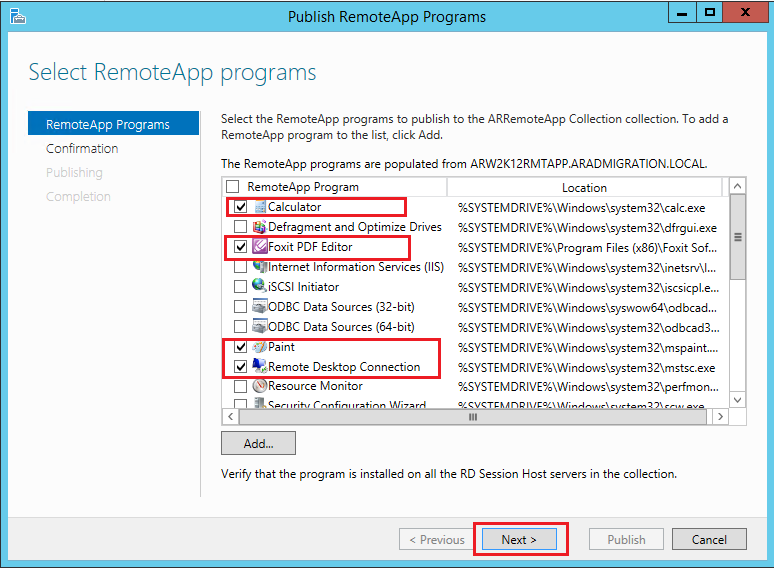 Close the Wizard after Completion of the Publishing Apps for the Remote Access. Now login to your RD Web Access see whether you can access the Apps.